Each morning I wake up and spend time with my Father. I cherish that time with Him. As I pray, I ask Him to help me experience Him throughout my day. Father, help me to see you in all things. Show yourself to me in big and small ways. Help me to know it is You. He shows Himself to me each day. But I have to be aware of Him. I have to have my heart and eyes open, otherwise I can miss Him. As parents, we need to teach our children how they can experience God on their own. Your child is never too young to experience God. To continue reading, please join me at Woman to Woman for Family Friday. 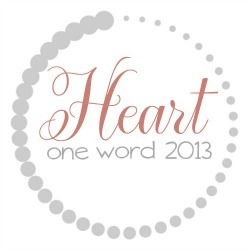 For 2013 my One Word is heart. I desire to have a heart like Jesus. I want people to see Him when they see me. Sometimes I feel like I need open heart surgery. My mad mommy voice took over, arms flailing, eyebrows scrunched low. Oh they were getting an ear full. The poor lady at the drive thru window was so gracious and pretended to not hear me, because I know she had to have heard. I am wondering if my friend hundreds of miles away heard. As I looked at the sweet lady taking my money and offering our food to us, my heart sank. Here, I had this beautiful opportunity to show the love of Jesus to her. I should have commented on her sweet smile and thank her for her kind words and wished her a blessed day. Instead, I was so ashamed of my actions that I had to duck my head. My heart sure did not reflect Jesus. My actions and words did not reflect Him. I had to repent to my Father for the way I blew up. I was offered His beautiful grace. Now I move forward. I start over. When "those" times stress us out, when "those" feelings threaten to come to the surface, turn to God. Let Him calm your heart and soul. Let Him show you how to move forward in love, not anger. This is where I stand with my One Word. I am still learning. Still messing up. Still asking for forgiveness. How are you doing with your One Word? Are you still working on it? Do you struggle or do you feel as though you are finally getting it? Share your experiences with us in the comments below.